My question: is this imported sand or sand from some field in the corn belt? I'm tired of propping up the industrial food system by shipping sand halfway across the U.S. for consumption when we have perfectly good sand right here at home. at least you haven't lowered yourself to pb & dirt. 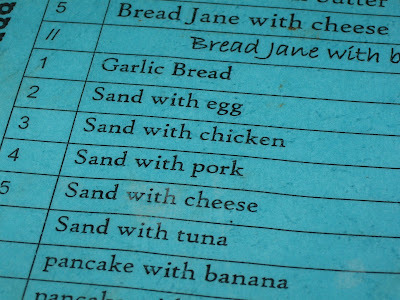 "when there was no crawdad, we ate sand"
The sand is good, but I'd like to know what the first number 5 is all about: Bread Jane? Anyone? where did you eat this??? i wonder how much longer Jane's going to be on the menu. it's not like the Lao PDR produces a lot of them.